After fighting blasphemy for four weeks outside theaters, American TFP members attended a holy hour of Eucharistic Adoration to make their efforts fruitful. 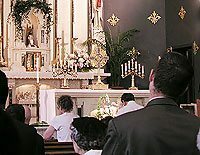 After fighting blasphemy for four consecutive weekends outside theaters showing the Da Vinci Code film, American TFP members strove to make their protests bear fruit by attending a holy hour of Eucharistic adoration on June 18, from 5-6 P.M. at Prince of Peace Church in Steelton, Pennsylvania. 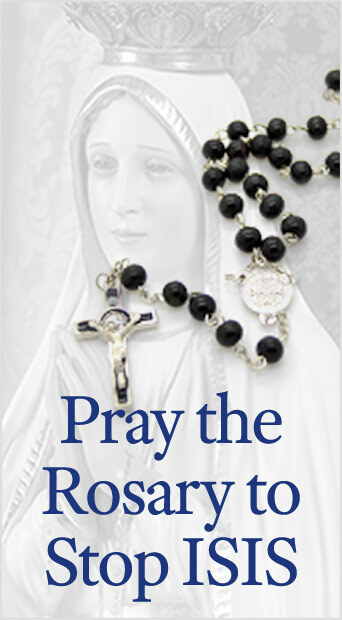 TFP members joined more than 1,000 groups and individuals around the nation who offered an hour of adoration at the same time. Members at TFP headquarters in Spring Grove, Penn. chose the nearby Prince of Peace Church for their hour, because it coincided with a visit of the miraculous International Pilgrim Virgin Statue of Our Lady of Fatima. 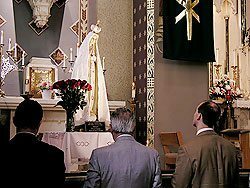 This gave them the opportunity to adore Our Lord and simultaneously venerate she who was His greatest consoler in all of history. This entry was posted in Anti-Blasphemy and tagged adoration, America, blasphemy, Catholic, Church, consolation, Corpus Chrisit, Da Vinci Code, Eucharist, film, God, holy, Holy Hour, Holy Hour Unites Thousands in Reparation, reparation, unite by TFP.org. Bookmark the permalink.